The differentiation of human pluripotent stem cells into functional neuronal subtypes has the potential to meet the demand for the high numbers of functional cells required for drug screening, disease modeling, and therapeutic application. 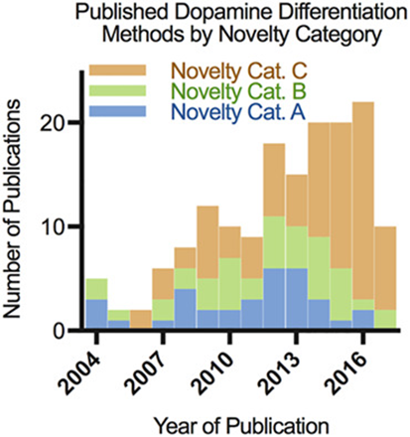 However, in the search for a reproducible, standardized, optimal differentiation methodologies for specific subtypes, dopaminergic neurons, for example, multiple different approaches already exist in the literature and more see publication every year. With this knowledge in hand, Rebecca Marton and John P. A. Ioannidis from Stanford University (California, USA) sought to understand the relative merits of various differentiation protocols and the main driving motivations for developing new approaches using dopaminergic neuron differentiation as a case study. Their new STEM CELLS Translational Medicine article now reports the findings of a study that systematically evaluated methods to differentiate dopaminergic neurons from human pluripotent stem cells, assessed the metrics employed to measure yield and protocol utility, established the uptake of the described methodologies in the broader scientific community, and identified those measures whose implementation could improve protocol comparisons and enhance their clinical translation . While the authors note that their overall results indicate a lack of understanding with regards to the extent to which new method development benefits the field, they also traced out means to effectively move forward. Solutions, in general, include developing a repository for stem cell differentiation protocols and establishing reporting guidelines to ensure optimal and reproducible differentiation practices for disease modeling as well as clinical applications [2, 3]. For more on how we can improve human pluripotent stem cell differentiation protocols, stay tuned to the Stem Cells Portal! Marton RM and Ioannidis JPA, A Comprehensive Analysis of Protocols for Deriving Dopaminergic Neurons from Human Pluripotent Stem Cells. STEM CELLS Translational Medicine 2019;8:366-374. Munafò MR, Nosek BA, Bishop DVM, et al., A manifesto for reproducible science. Nature Human Behaviour 2017;1:0021. Ioannidis JP, How to make more published research true. PLoS Med 2014;11:e1001747.